The future dynamics of forest species and ecosystems depend on the effects of climate change and are related to forest management strategies. The expected impacts of climate change are linked to forest growth and productivity. An increase in the length of the growing season and greater productivity are likely as well as shifts in average climatic values and more variable frequencies, intensities, durations and timings of extreme events. The main aim of this work is to assess and describe the climatic requirements for Italian forest tree species. We used 7.272 field observations from Italian National Forest Inventory plots and average annual temperatures and precipitation as interpolated from raster maps with 1 km spatial resolution. On this basis we evaluated the current observed distributions of the 19 most important tree species in Italy with respect to potential climatic limits based on expert knowledge and the available literature. We found that only 46% of the observations fall within the potential joint temperature and precipitation limits as defined by expert knowledge. For precipitation alone, 70% of observations were within the potential limits, and for temperature alone, 80% of observations were within the potential limits. Similarity between current observed and potential limits differ from species-to-species with broadleaves in general more frequently distributed within the potential climatic limits than conifers. We found that ecological requirements and potential information should be revised for some species, particularly for the Pinus genus and more frequently for precipitation. The results of the study are particularly relevant given the threat of climate change effects for Italian forests which are broadly acknowledged to be a biodiversity hotspot. Further investigations should be aimed at modelling the effects of climate changes on Italian forests as a basis for development of mitigation and adaptation forest management strategies. Predictive modelling of tree species distributions on the Iberian Peninsula during the Last Glacial Maximum and Mid-Holocene. Ecography 30: 120-134. Shifting with climate? Evidence for recent changes in tree species distribution at high latitudes. Ecosphere 5: art83. European mixed forests: definition and research perspectives. Forest Systems 23: 518-533. A spatial dataset of forest mensuration collected in black pine plantations in central Italy. Annals of Forest Science 74: 50. Assessing forest windthrow damage using single-date, post-event airborne laser scanning data. Forestry 1-11. 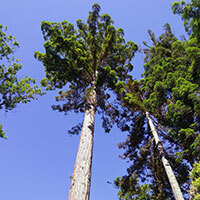 Forestry research to support the transition towards a bio-based economy. Annals of Silvicultural Research 38: 37-38. I boschi delle regioni meridionali e insulari d’Italia: tipologia, funzionamento, selvicoltura [The woods of southern and insular regions of Italy: typology, functioning, silviculture]. CLEUP, Padua, Italy, pp. 472. Are Italian stone pine forests (Pinus pinea L.) an endangered coastal landscape? A case study in Tuscany (central Italy). Italian Journal of Forest and Mountain Environments 72: 103-121. Statistical inferential techniques for approaching forest mapping. A review of methods. Annals of Silvicultural Research 42 (2): 46-58. Correction of a 1 km daily rainfall dataset for modelling forest ecosystem processes in Italy. Meteorological Applications 23: 294-303. WorldClim 2: new 1-km spatial resolution climate surfaces for global land areas. International Journal of Climatology 37: 4302-4315. European Forest types: toward an automated classification. Annals of Forest Science 75: 6. A European daily high-resolution gridded data set of surface temperature and precipitation for 1950-2006. Journal of Geophysical Research 113 (D20): 1691.
climate change 2001: the scientific basis. Contribution of Working Group I to the Third Assessment Report of the Interngovernmental Panel on Climate Change (Houghton, JT, Ding Y, Griggs DJ, Noguer M, van der Linden PJ, Dai X, Maskell K, Johnson CA eds). Cambridge University Press, Cambridge, United Kingdom and New York, NY, USA, pp. 881. Climate change 2014: impacts, adaptation, and vulnerability. Part A: global and sectoral aspects. Contribution of Working Group II to the Fifth Assessment Report of the Intergovernmental Panel on Climate Change (Field CB, Barros VR, Dokken DJ, Mach KI, Manstrandrea MD, Bilir TE, Chatterjee M, Ebi KL, Estrada YO, Genova RC, Girma B, Kissel ES, Levy AN, MacCracken S, Mastrandrea PR, White LL eds). Cambridge University Press, Cambridge, United Kingdom and New York, NY, USA, pp. 1132. Estimating potential habitat for 134 eastern US tree species under six climate scenarios. Forest Ecology and Management 254: 390-406. Integrating forest inventory and analysis data into a LIDAR-based carbon monitoring system. Carbon Balance and Management 9: 1-11. Some refinements on species distribution modelling using tree-level National Forest Inventories for supporting forest management and marginal forest population detection. iForest - Biogeosciences and Forestry 11: 291-299. Modeling primary production using a 1 km daily meteorological data set. Climate Research 54: 271-285. EU-Forest, a high-resolution tree occurrence dataset for Europe. Scientific Data 4: 160123. Hot-spots for conservation of plant diversity in the Mediterranean Basin. Annals of the Missouri Botanical Garden 84: 122-127. Managing forests in a changing world: the need for a systemic approach. A review. Forest Systems 26 (1): eR01. Geobotanical mapping and its levels of study. In: “Plant and Vegetation Mapping. Geobotany Studies (Basics, Methods and Case Studies)”. Springer- Verlag Berlin Heidelberg, Germany, pp. 1-6. An uncertainty assessment framework for forest planning adaptation to climate change. Forest Policy and Economics 41: 1-11. A simulation-based approach to assess forest policy options under biotic and abiotic climate change impacts: a case study on Scotland’s National Forest Estate. Forest Policy and Economics [in press]. European atlas of forest tree species. Publication Office of the European Union, Luxembourg, pp. 202. Extreme weather and climate events with ecological relevance: a review. Philosophical Transactions of the Royal Society B: Biological Sciences 372: 20160135. Drought sensitivity of beech on a shallow chalk soil in northeastern Germany - a comparative study. Forest Ecosystems 3: 24. Forest Management Approaches for Coping with the Uncertainty of Climate Change: Trade-Offs in Service Provisioning and Adaptability. Ecology and Society 19: 397-412.